The backwater planet of Tatooine has long been known as a haven for criminals and scum of all kinds. Unsympathetic to the Rebel Alliance and too unimportant to draw the attention of the Empire, this desert planet has fallen under the rule of crime lords, and no crime lord has more influence on Tatooine than Jabba the Hutt. When a small band of Rebel refugees is forced to crash-land on Tatooine, Jabba the Hutt is already scheming for how they can be manipulated to advance his empire. 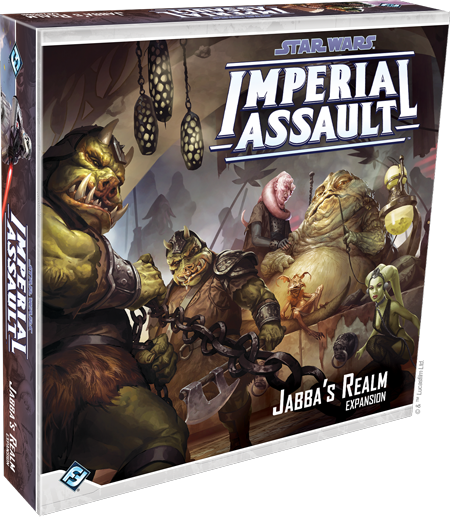 In Jabba’s Realm, the newest upcoming expansion for Imperial Assault, you’ll have the chance to return to Tatooine once more and experience what it truly means to cut a deal with Jabba the Hutt. This expansion is packed with new terrain tiles, sixteen plastic figures, an entirely new full-length campaign, and new skirmish missions, including rules for running massive, four-player skirmish games! 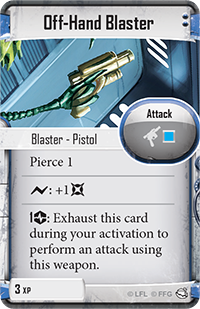 Today, we’ll take our first look inside this expansion by exploring the new heroes that fight for the Rebel Alliance. Though they have no cause to love the Rebel Alliance, the three new heroes in Jabba’s Realm each have reason to hate the Empire. 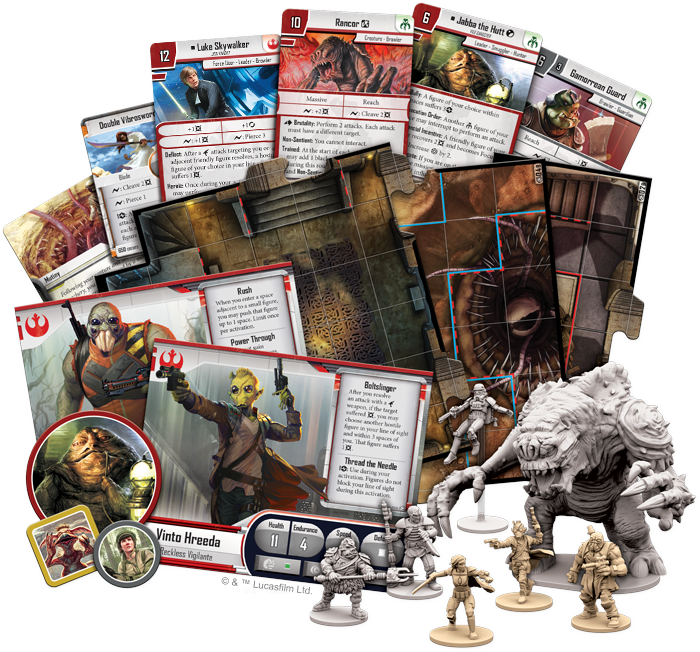 Now, as you experience the brand-new campaign included in Jabba’s Realm, these heroes give you entirely new ways to play the game and walk through the Star Wars galaxy. 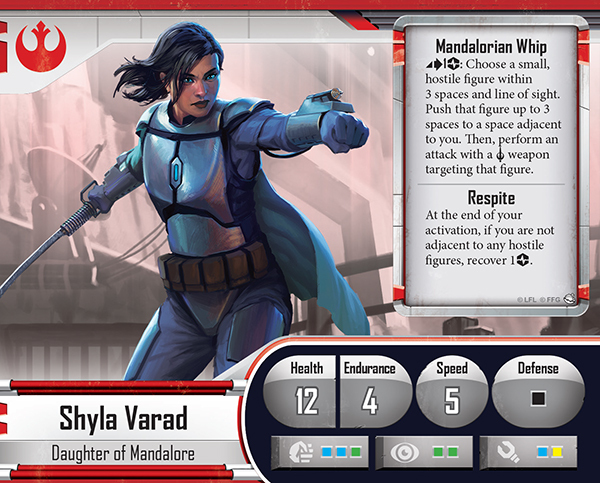 The first new hero you’ll encounter is Shyla Varad, a Mandalorian warrior who’s now far from home. Though she may no longer have a place among her own people, Shyla’s skills in combat have not deserted her, and she’s eager to use them against any servants of the Empire that she encounters—on Tatooine or beyond. In a galaxy where blasters are commonplace, devotion to melee weapons may seem hopelessly old-fashioned. Still, Shyla has the skills to make her blade as dangerous as any laser pistol, especially with her Mandalorian Whip. 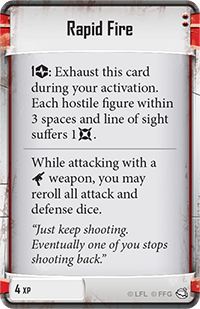 By spending an action and suffering a strain, you can choose any small enemy figure within three spaces and line of sight. Then, you pull that figure adjacent to you and attack with a melee weapon! 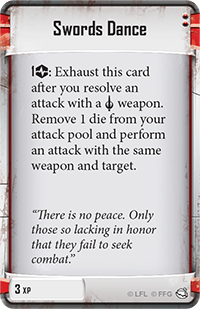 By pulling your enemies towards you and dealing with them at close quarters, you can cut your foes to pieces in no time. 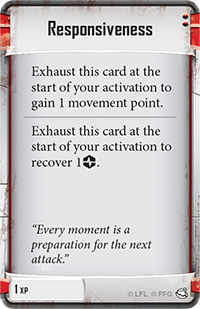 Once you’ve defeated your target, you can recover your strain with Respite, keeping you ready to move and strike again. Shyla Varad’s Class deck further supports her persona as a graceful, deadly swordsman. Responsiveness can be used to gain extra movement or recover strain, while Swords Dance allows you to swoop in for another attack immediately after attacking with a melee weapon. Shyla also has access to a variety of secret tech, including Smoke Bombs and Remote Detonators. 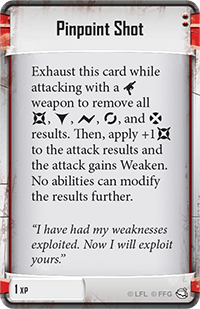 Even as she duels her enemies, you can use these tools to wreak havoc among the other servants of the Empire. If any hero forms the perfect counterpoint to Shyla’s deadly, wheeling grace, it’s Onar Koma, the Aqualish bodyguard. This powerful warrior boasts a stunning twenty health, but he has no defense dice, forcing him to simply endure any damage dealt by an attack. Still, Onar is not without defenses. Power Through keeps him from gaining Harmful conditions, and when he rests, he recovers two additional damage. Onar’s size also gives him an unstoppable momentum. 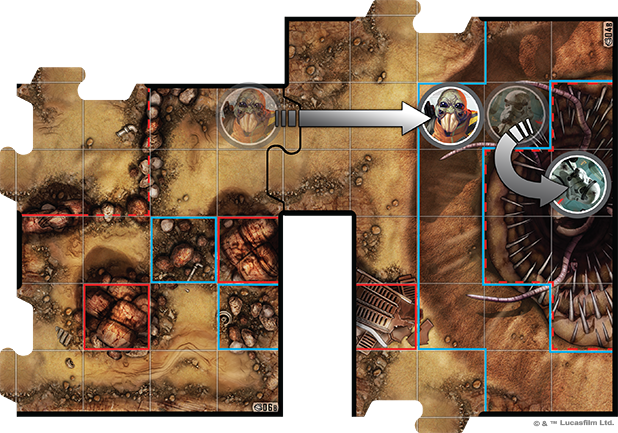 When he enters a space adjacent to a small figure, you can push that figure one space, potentially blocking enemy firing lanes or thrusting figures into danger—such as, for instance, the Rancor’s holding cell or the dreaded Pit of Carkoon! Onar Koma uses Rush to knock a Stormtrooper into the Sarlacc! 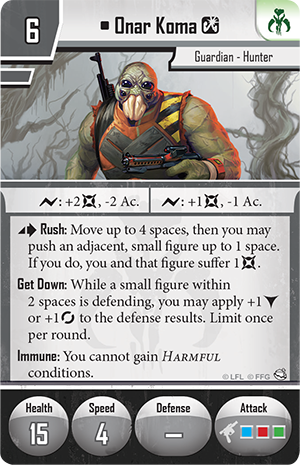 Onar’s Class deck enhances the two essential aspects of his character: the bodyguard and the brawler. If you’re focused on defending your friends, Get Down can increase another hero’s defense, while Stay Behind Me increases your health and allows you to take damage on behalf of another hero. On the other hand, you may focus on making sure Onar deals as much damage as possible. In that case, Mutual Destruction lets you suffer damage to deal more damage to your foes and Don't Make Me Hurt You can massively increase the amount of damage you deal with every attack. The final new hero that you’ll encounter in Jabba’s Realm is Vinto Hreeda, a fearless Rodian vigilante. Everything Vinto loved was destroyed by the Empire, and now he’s devoted himself to taking down the Empire, one Stormtrooper at a time. 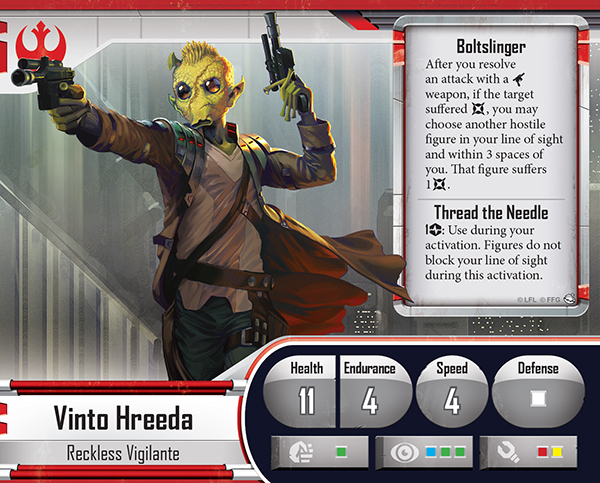 Few beings in the galaxy have the skills with a blaster to match Vinto Hreeda. His Boltslinger ability allows him to deal damage to another nearby hostile figure so long as he hit his first target, giving you an unparalleled ability to run and gun. 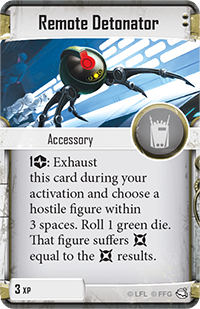 At the same time, your targets will have a hard time escaping your shots, even at the back of a crowd—Thread the Needle allows Vinto to suffer a single strain to trace line of sight through figures during his activation! Vinto Hreeda’s Class deck brings his already dangerous skills to a truly formidable level. With Pinpoint Shot, you can ensure that any attack will deal damage and weaken your target, even cutting through your enemy’s dodge results. 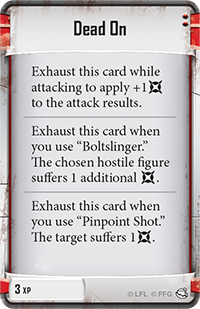 Dead On can supplement Pinpoint Shot, as well as your normal attacks and the Boltslinger ability, dealing more damage across the board. 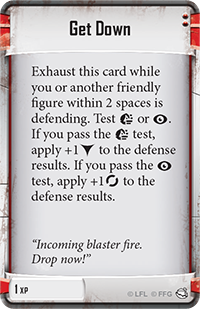 Then, if you just want to get more damage onto your enemies, an Off-Hand Blaster gives you another attack just by spending a strain, and Rapid Fire can damage every single hostile figure within range, cutting a swath through the enemies that stand in your way. 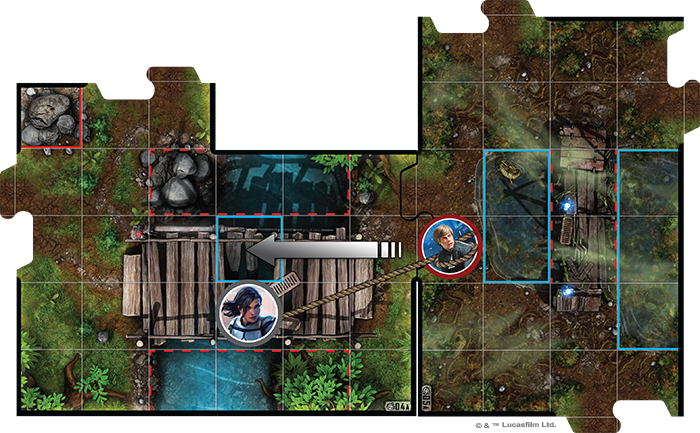 Although each of these heroes may find themselves aiding the Rebel Alliance during a campaign game, their true natures come out in a frantic action and firefights of a skirmish—all three of these heroes join the Mercenaries faction for the skirmish game. And because they maintain their basic identities, their skirmish versions can offer a massive boost to the galaxy’s Mercenaries. Shyla Varad takes her place as one of the most dangerous melee fighters in the skirmish game. She rolls three dice during every attack and can spend surges to deal more damage, pierce armor, or cleave adjacent figures. 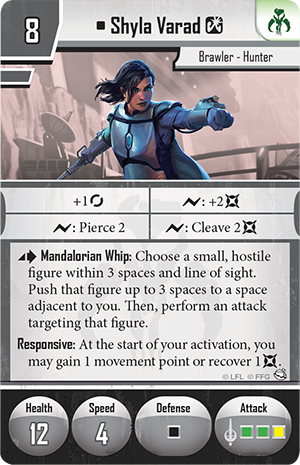 Shyla also retains her Mandalorian Whip, allowing her to pull in figures from range and immediately attack them, giving her unprecedented control over the battlefield and how your opponent’s figures are positioned. Finally, Shyla can gain another movement point or recover a damage at the beginning of her activations, giving you the power to adapt to any situation. Shyla Varad uses her Mandalorian Whip ability to pull Luke Skywalker into range for an attack. 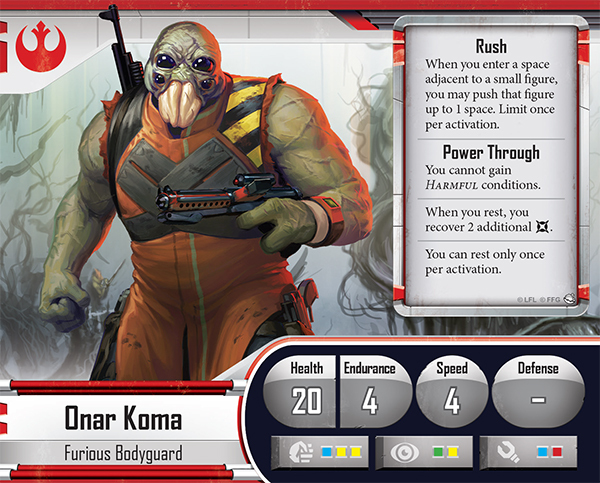 Onar Koma still offers a massive amount of health for only six points, though his lack of defense dice means that most attacks will immediately harm him. Still, Onar excels at being in the thick of the action. His attack features three powerful dice and his surge abilities allow him to sacrifice accuracy for damage. 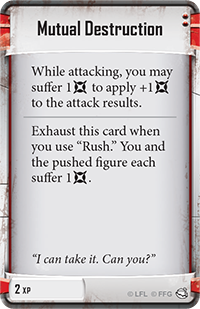 With Rush, you can move up to four spaces and push an adjacent figure, dealing damage to both you and your opponent. 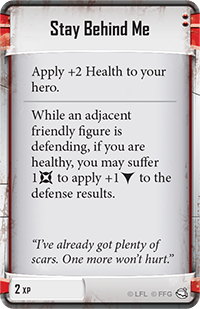 And if that weren’t enough, while a nearby figure is defending, Onar automatically adds a block or an evade to the defense, helping your other figures survive longer than ever. Finally, the Mercenaries gain the aid of the vengeful Vinto Hreeda, a fast and powerful ranged attacker. Vinto’s surge abilities rank among the best in the game, giving you multiple benefits for just a single surge. 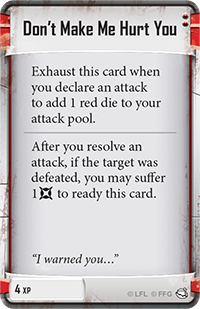 Rapid Fire lets you perform two attacks on your turn, giving you twice as many chances to deal damage. 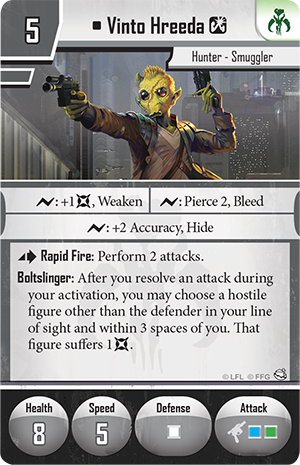 Then, whenever you resolve one of those attacks, you can trigger Boltslinger to deal damage to another figure. In a one-against-many battle, few figures can put out as much sheer damage as Vinto Hreeda. Whether you support the Rebel Alliance or fight for the highest bidder as a Mercenary, you’ll find three new heroes to support your campaigns and skirmishes in the Jabba’s Realm expansion. 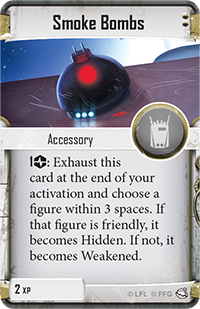 Join us next time for a preview of the new figures and tactics that the Imperial player gains in this expansion!